The historical geography of the Dutch province North-Brabant and the Belgian province Antwerp is the studyobject of dr K.A.H.W. Leenders. You find here my curriculum vitae, a list of my presentations in the short future and a list of my publications. Furthermore are added the texts or summaries (some in Dutch, French or German) of some of my publications concerning the historical geography of this part of Brabant. You also can consult an extensive list of charters concerning my study-region. That list is ordered by place (and in Dutch only). Some links to other historical-geography sites and more literature about Brabant (in French, English, German) complete this site. Additional there are some Guest Sites. 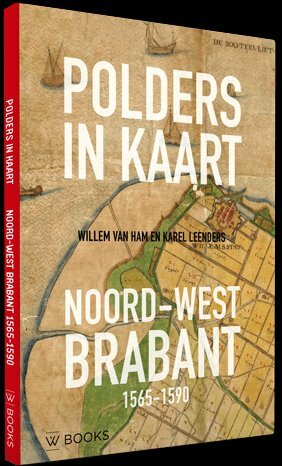 The book Polders in maps - North-West Brabant 1565-1590 has been published at WBOOKS in Zwolle on February 21, 2018. This publication has reproductions on paper (100x100 cm) of the Gastelse Kaart (1565) and the Mauritskaart (1590) with a detailed and richly illustrated explanation by Willem van Ham and Karel Leenders. Both maps show in great detail the region between Ooltgensplaat and Zevenbergen, Strijen and Roosendaal. Be amazed by the amount of water that still existed, about the progress of the embankments in the intervening 25 years, about the countless details such as bridges, windmills, ferry boats, villages and fortified towns, but also about a part of the history of cartography. You can order the book here. Thanks to subsidies it costs only 24.95 Euro plus pp. The book De dynamische hoeve. Veranderingen in boerderijgebouwen en hun omgeving in de Meierij van 's-Hertogenbosch 1662-2015 was published at Pictures Publishers in Woudrichem in 2015. What now is seen as a typical Brabant farm is a building with brick walls carrying a roof that is mainly covered with reed with 5 rows of tiles. On the yard there are few or none outbuildings. The farm of 1662 had a completely different character. What changed? How, why and when? That is described in the book ‘De dynamische hoeve’ (The dynamical farm). You can order this book here. It costs 22.50 Euro plus pp. The book Verdwenen Venen. Een onderzoek naar de ligging en exploitatie van thans verdwenen venen in het gebied tussen Antwerpen, Turnhout, Geertruidenberg en Willemstad 1250 - 1750. Actualisering 2013. was published in 2013 at Pictures Publishers in Woudrichem, The Netherlands. Yes, indeed, the 1989 book, but updated with the results of research done in 1985 - 2013, now in colour and for a affordable prize: 25 Euro! Click here to read more (in Dutch!) and for ordering. A long text about the medieval saltproduction asks for your comment or additions! But... only Dutch text.